"We are like chameleons. We take our hue and the color of our moral character, from those who are around us." "I am certain that I can have no knowledge of what is outside me except by means of the ideas I have within me." An overview of my research framework and the core questions it generates. I focus on the embryonic environment; however, the maternal environment is linked to the embryo environment via maternal care (e.g. nesting behavior) and provisioning (e.g. yolk caloric content). 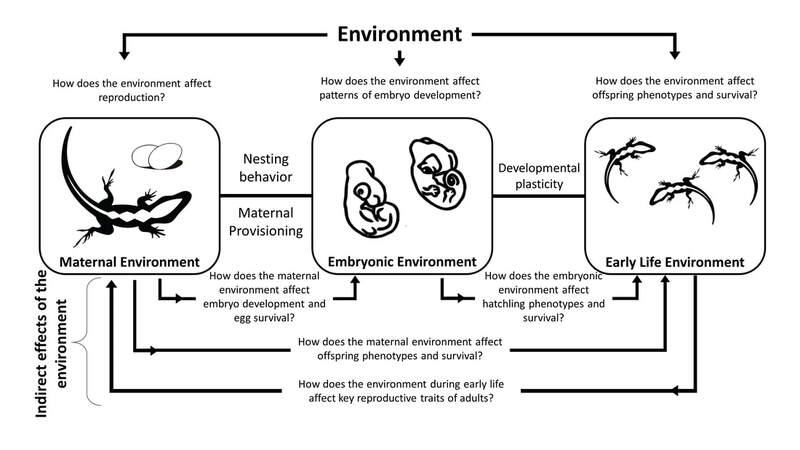 Moreover, via developmental plasticity, the embryo environment is linked to the success of neonates and ultimately adults. Environmental conditions can directly influence each life stage; however, they can also affect one stage through its effects on another (i.e. indirect effects). I have always been fascinated by the roles of ‘nature vs nurture’ in development. For 400 years, philosophers have debated the relative importance of inborn and acquired traits (Locke’s ‘blank slate’ vs Descartes ‘innate ideas’). Genes are powerful agents that shape our bodies, govern our physiology, and direct our behavior; however, our genes interact with the environment at each stage of development. The goal of my research is to understand how the environment influences fitness-relevant phenotypes across multiple life stages. As a developmental ecologist, I focus on the embryonic stage; however, I incorporate studies of reproduction (i.e. adults) and early life (i.e. neonates) to understand the causes and effects of patterns of embryo development. Humans are rapidly changing the environment on a global scale and embryos are particularly sensitive to environmental disturbance; thus, it is an important time for us to understand the impact of the environment on development. My research framework uses both field and lab methods and integrates physiology, morphology, behavior, performance, ecology, and evolution. Thus, it can accommodate a diversity of student interests, train students in an assortment of methods, and immerse them in a variety of theory. Moreover, it is of grander significance because it helps us understand an age-old question: how does the developmental environment shape our future? All organisms begin life as a single cell and pass through a series of developmental stages to reach maturity. Though the basic biochemical processes required for development are usually optimized within a narrow range for each environmental condition (e.g. temperature), the environmental landscape in which development occurs varies through space and time. For this reason, embryo physiology may compensate for large changes in environmental factors during development. I use anole lizards as models to understand how embryos respond to a changing environment and successfully complete development. These lizards bury their eggs a few centimeters beneath the surface. The temperature in these shallow nests can vary by as much 12 °C in a single day. Basic physiological processes, like heart rate, must compensate for such extreme changes on a daily basis. Heart rates of anole embryos across the full range of nest temperatures. On a typical day during development, embryo heart rate can vary by as much as 100 bpm. In seasonal environments, the timing of reproduction can impact offspring fitness. Offspring produced late in the season often experience decreased survival compared to earlier-produced individuals. This trend has been studied across a wide-variety of taxa and explanations for the phenomena are diverse. Late-produced offspring may suffer from increased competition from earlier-produced conspecifics that are larger and better able to acquire resources. Late-produced offspring may, independent of competition, have access to a poorer pool of resources during a critical early-life stage or simply have less time to grow prior to the harsh winter or dry season. Regardless, life-history theory predicts that when this pattern is consistent through time (from year to year), patterns of maternal investment into offspring should shift seasonally. Specifically, selection should favor females that alter their investment into individual offspring such that, late in the season, females produce fewer, better provisioned offspring when the quality of the environment is relatively poor. I use brown anoles to learn how maternal investment in offspring changes throughout the reproductive season. Mitchell TS, Hall JM, Warner DA. 2018. Female investment in offspring size and number shifts seasonally in a lizard with single-egg clutches. Evolutionary Ecology, 32 (2-3), 231-245. Key reproductive traits can change seasonally in species that have a long reproductive season. Brown anoles change from producing many, smaller offspring early in the season (Cohort 1) to fewer, better provisioned offspring late in the season (Cohort 3). However, because early-produced offspring are more likely to survive than late-produced offspring, overall reproductive efforts is still greatest early in the season. The ecological and economic impacts of invasive species are a growing, cosmopolitan concern. Currently, urban land area is increasing at a rate potentially twice that of human population growth, which leads to the encroachment of plants and animals into urban areas. The Anthropogenically Induced Adaptation to Invade (AIAI) hypothesis predicts that populations of organisms adapted to urban areas may be primed to become successful invaders of similarly disturbed habitats elsewhere. This is because urban areas in different parts of the world likely impose similar challenges when compared to natural areas of the same regions. As part of a robust test of the AIAI hypothesis, my research provides novel insight into the fundamental causes of biological invasion by exploring the evolutionary consequences of novel environments on an oft neglected life-history period: embryonic development. My aim is to better understand how organisms adapt and acclimate to human-disturbed habitat and how such changes may influence rates of naturalization and invasion. ​Hall JM, Warner DA. 2017. 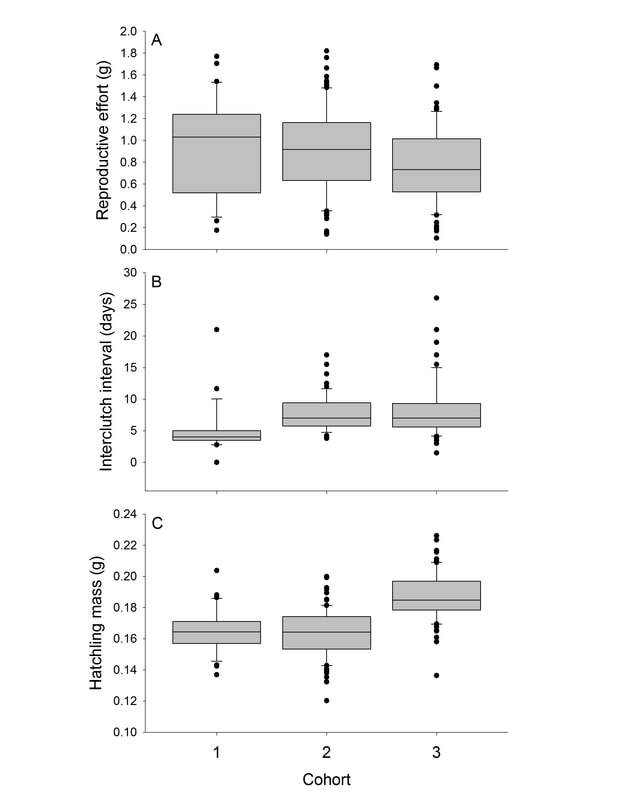 Body size and reproduction of a non-native lizard are enhanced in an urban environment. The Biological Journal of the Linnean Society, 122(4), pp. 860-871. Hall JM, Warner DA. 2018. ​Thermal spikes from the urban heat island increase mortality and alter physiology of lizard embryos. Journal of Experimental Biology. 221(14), jeb181552.